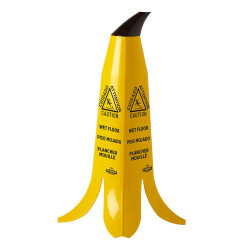 The only safety cone that people will actually pay attention too! And even take a photo with. Unlike the flip out "A" frame style, these draw attention. They nest into a stackable tower for easy storage. Want even more standout? Add the Banana brown top, included with each purchase. This makes a convenient handle and attracts even more attention. Packaged 3 per case.